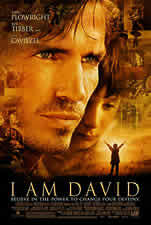 Just finished watching I Am David. It's actually kinda funny because, if you look at the cover of the movie, you would assume Jim Caviezel is David. I found that a little misleading, and I'm sure it was more of a marketing issue. 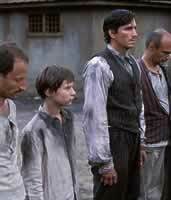 It was certainly no disappointment to find out Caviezel filled only a supporting role. No harm, no foul, for I much enjoyed I Am David, and the movie could have done just as well without a big name, big face to fill DVD cover. The real star of the movie is virtually unknown child actor, Ben Tibber. Movies like I Am David, Empire of the Sun and Sixth Sense prove that it doesn't take years of polished practice and experience to deliver a convincing performance. It is always fun to see the child stars in the special features, to see that they are indeed just kids. To be honest, I feel I can relate more with their point of view than that of the icons of Hollywood. The children seem to have more passion and instinct than some of the seasoned adult professionals. Adults often take themselves too seriously and get wrapped up in the calculation of their performance, instead of just letting it flow, even with a hint of fun. Much can be learned from the authenticity of children. Oftentimes, this genuineness doesn't need to be staged. Child actors really don't get enough credit. Ben Tibber, for example, convinces me more of his plight in this film with one look than many actors could achieve with a hundred words. I appreciated that the filmmakers didn't felt obligated to fill I Am David with droves of sideline filth and profanity just to make things "interesting" for the adult audience. This film does quite well for me as a palpable story, even carrying its PG rating. The acting, locations, sets and camera work do well enough to keep this film rolling and my eyes from rolling. I confidently recommend the compelling I Am David to virtually any audience (except to the outlandishly critical, to whom I would say "lighten up"! ).